The role of antibiotics is both good, and bad in honey bee microbia. Researchers at the University of Texas, Austin, led by postdoctoral researcher Kasie Raymann, PhD, and Nancy Moran, PhD, have uncovered a potential clue to one of the causes of honey bee decline that has confounded beekeepers for the last decade. Their research points to an unlikely source: the intestinal tract of the honey bee and the diverse microbial lifeforms that call the honey bee gut home. While microbiologists have been intrigued with the role of the microbiome for some time, only recently has its significance made its way down to the general public. Further, the role of antibiotics has come to be better appreciated as an important weapon against disruptive, “bad” bugs, but that also carries the unintended consequence of killing “good” bugs, often underappreciated until they are gone. The latest research, published in the Open-Access journal PLOS Biology in March 2017, advanced the understanding of honey bee gut microbiota from the groundbreaking work of Moran and her team. (See the January 2017 Bee Culture article, “Honey bee Gut Microbiota”). With a better appreciation of the important role that a healthy honey bee gut microbiome plays, Raymann and Moran set out to disrupt gut symbiosis in healthy bees in long-established rooftop hives on campus to see what would happen. According to Raymann, the most obvious way to do this was through antibiotic application. The results were unexpected. Within a week of treatment with the commonly-used antibiotic tetracycline, twice as many bees in the treatment group were dead as compared to the control group. Further examination explored which organisms in the honey bee gut perished and which ones flourished. Healthy microbes – the good bugs – that aid in the digestion and absorption of nutrients and also keep harmful microbes – the bad bugs – in check were decimated. The opportunistic bacteria Serratia, omnipresent, but typically under control in a healthy gut environment, rapidly colonized in the gut and was a likely suspect in the cause of death. 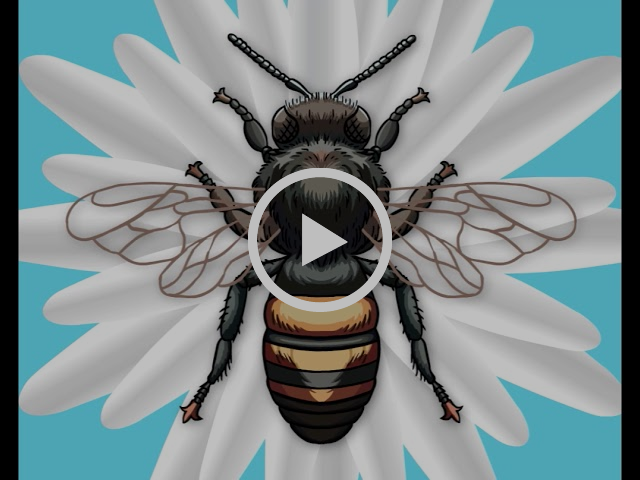 I connected with the two researchers to learn more about their findings, the role that antibiotics and other treatments play on honeybee gut health, as well as antimicrobial resistance. What led you to conduct this research? KR: The main point of the study was to perturb the microbiome in order to better understand its role in honey bee health. Using antibiotics was an easy way to go about doing this because we know from experimental studies in other animals that it would, in fact, have an effect on the gut community. We weren’t expecting the results we saw in terms of survival. The main idea was to study the microbiome and its effect on the health of the honey bee as opposed to looking at the effect of antibiotic application. NM: From previous long-term research, as well as research in humans and livestock, we knew that antibiotics disrupt the gut microbiome. However many experiments are in the lab with germ-free bees that we can compare. This is unrealistic in a real-world setting. In the hive, we can’t have germ-free bees because they immediately get microbes from their nestmates. This study was a different experimental approach, to disrupt them and then look at more realistic hive conditions. One of your key findings was how quickly antibiotics affected the gut microbiota – the first day that you tested the bees after five days post-treatment. Were you expecting this? KR: Yes, I was expecting it, and actually expected to see a difference a little quicker. If you look closely at the results, after five days post-treatment, there wasn’t much change. We’re not sure why there wasn’t a huge and immediate impact, which is what we were expecting. Your study showed significantly decreased survival. Yet, antibiotic application for the prevention of American Foulbrood (AFB) is a long-held practice among commercial and backyard beekeepers. Do you expect/suspect that many will continue this practice despite your findings? KR: For newer formulations beekeepers need a prescription based on new FDA regulations. This might cause less use of antibiotics. But overall, we’re not sure how this research will be received. NM: If there is a pathogen like American Foulbrood it’s alarming when a beekeeper sees it. On the other hand, if adult bees become infected with Serratia, they fly off and die. It’s not apparent as AFB. This study shows half survival rate; this would be subtle if you just put antibiotic on the hive. You might not necessarily notice, you might just think the hive is not doing as well. On January 1, 2017, new FDA regulations went into effect requiring a prescription for Terramycin (oxytetracycline) and Tylan (tylosin), two of the most commonly used antibiotics for honey bees. Do you think this is too little, too late to help restore honey bee gut health in the U.S.? NM: We’ve done a lot of surveying. From what we can tell, a healthy untreated hive has close to normal honey bee gut microbiota. 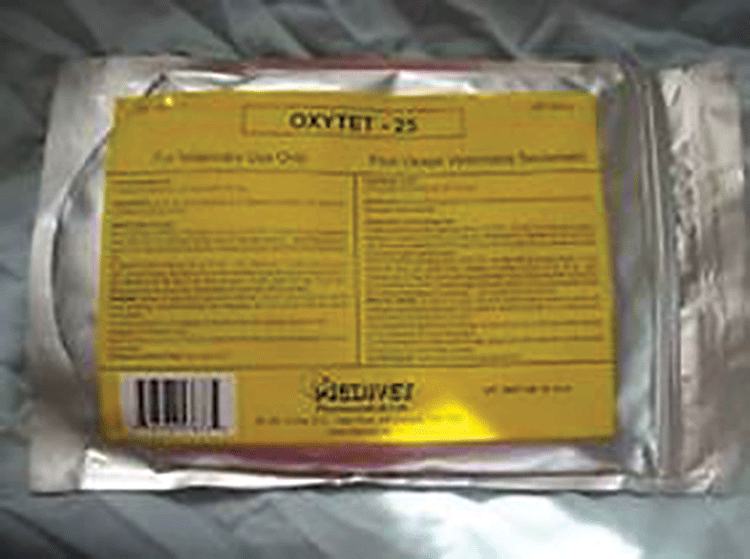 All of the organisms are there and some have strains that are resistant to treatment. More or less, if they’re not treated (with antibiotics), their gut microbiota appears to be normal. You draw a parallel to Clostridium difficile, a devastating intestinal infection for humans. Is there a similar pathogen for honey bees (e.g., nosema)? KR: Serratia is similar to C. diff because it is also an opportunistic pathogen. Like humans, in cases where bees have a complete and healthy microbiota, it’s easier to ward off infection. NM: Like C. diff, Serratia is always present at a low level; we’ve seen this repeatedly in lab studies. While it’s present, it represents just a tiny proportion over the overall microbiome in healthy bees. But it’s always lurking there. 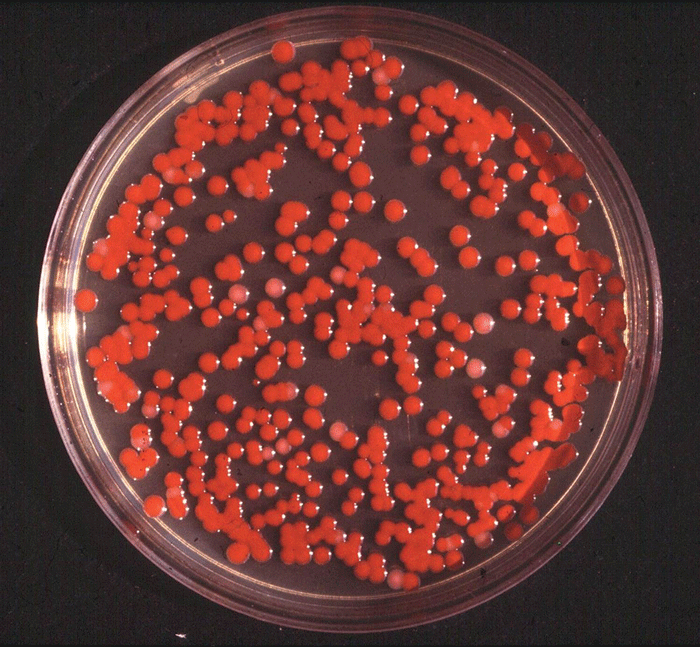 When the gut microbiome is disrupted, Serratia colonizes under certain conditions and it dominates the community. NM: Nosema is closer to a fungus than bacteria. We have some experiments underway for Fumagilin-B. We can’t expect the results to necessarily be the same, it’s unknown. The reason that it wasn’t included in this study was because it’s not obvious that it wouldn’t have an effect on the gut microbiota (like an antibiotic would). 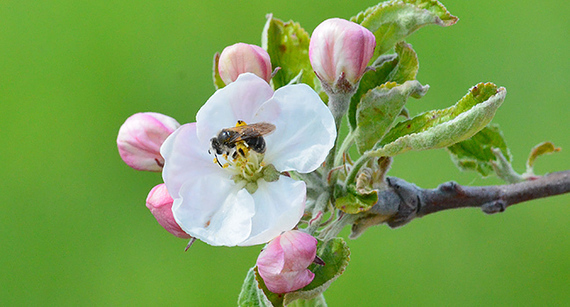 In this study, it was the Serratia pathogens that spring into action in bee colonies. There is a simultaneous study being conducted out of the University of Wisconsin), so this area is starting to be better appreciated. KR: Serratia appears to be a common opportunistic pathogen of honey bees, that in some cases might be transmitted through Varroa mites (NL Burritt et al. 2016 PLOS ONE). In fact, there are probably several other bacterial pathogens infecting bees that we don’t know about because they usually leave the hive to die, so it’s difficult to know without seeking them out and testing. But, Serratia is promising for future research. Can your research be translated to Apistan for Varroa mite control? Does the same mentality apply in terms of resistance? NM: Resistance (to treatment) evolves rather predictably. Foulbrood took 50 years; one explanation for that is that the pathogen that causes AFB doesn’t only live in beehives, so the entire population was not being exposed to antibiotics. If you kill off all exposed pathogens, it will prevent resistance, because you’ve completely destroyed the population. But, as we know, this is rarely the case. There is a long history of resistance, and the outcome is fairly predictable. Our research has mostly focused on bacteria. Treatments for varroa mites aren’t necessarily predictive of gut health, so we don’t know as much (about resistance to those treatments). Is it possible to reverse the resistant genes found in the U.S. honey bees? If so, how long would/could that take? NM: While we can expect the resistant genes to drop in frequency when not faced with antibiotics, they probably won’t totally disappear. Some sources of bees that we have sampled for resistance were very recently treated, and some were treatment-free, and probably hadn’t been treated in generations. One example of this is feral honeybees in Southern Utah that been there for decades, but originally came from a beeyard. In the U.S., every bee had some evidence of the resistance gene, even if it was at very low levels. In bees from other countries (that don’t use these antibiotics), the resistance gene is totally lacking. Incidentally, this is the same case as with humans – once a gene has transferred, it’s hard to eradicate. What steps (big and small) can commercial and backyard beekeepers take to prevent antimicrobial resistance in their bees? NM: The main thing is not to use antibiotics for prevention; if there is evidence of a severe pathogen, then it’s OK to use them. We can say this about humans as well, where antibiotic use has resulted in resistant genes. Antimicrobial resistance with American Foulbrood likely came from honey bees, which was then adapted by the pathogens that caused foulbrood, where there is now a reservoir of genes resistant to treatment. Do you think the findings from this research help to provide a missing piece to the colony decline mystery? NM: It’s what I would call a pet theory, primarily because of the timing. CCD made headlines in 2006, which was when Tylan was first FDA approved. One possibility is that the healthy gut bacteria had developed resistance to Terramycin so it evolved to survive despite treatment. With the newer antibiotic, it conceivably disrupted gut microbiota and exposed the microbiome (and host honey bee) to viruses and bacteria, which led to such large population losses. It’s possible that this type of disruption plays a role in the ability to fight off disease and nutritional stress, which is an area of further study. 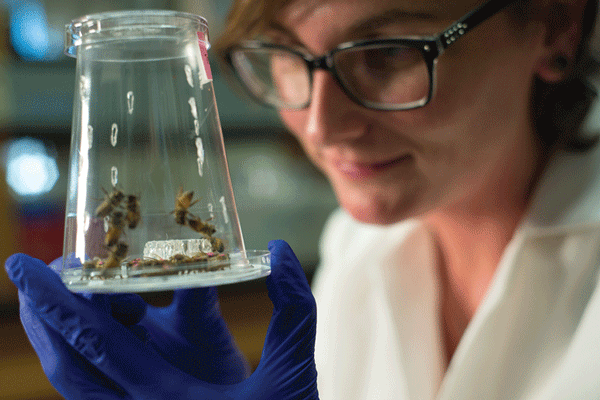 Were the bees in this study exposed to a “normal” amount of pesticide/insecticides? Do you think exposure to these chemicals also play a role in honey bee gut health? NM: Living in central Austin, and foraging on ornamentals on campus, I have to believe there is a high use of chemicals by landscaping. This is not an agricultural setting, but I would say the bees in this study were exposed to similar amounts of pesticides as a backyard beekeeper living in a neighborhood. In fact, another graduate student at UT is looking at the effect of glyphosphate (a broad-spectrum herbicide) on bee gut health, and gut bacteria. What we studied doesn’t rule anything out in terms of bee mortality – if something new is happening, it’s because of something new. Antibiotics are not the only problem. Until recently, the role of the gut microbiome in both humans and honey bees has been relatively under-appreciated. What are you looking at researching next? KR: Serratia and trying to understand how it affects honey bee health and how and when it is virulent for bees. For example, are bees without a microbiome more susceptible to this infection? Also, as mentioned above, we are in the early stages of determining if and how neonicinotoids affect the microbiome. Lastly, we are interested in more fine-scale changes induced by antibiotics at species level, including different aspects of exposure and infection. NM: The effect of nutrition on the gut microbiotia and relationship to overall honey bee health is another area of continued research interest. Research has just been published in the journal Proceedings from the National Academy of Sciences (PNAS, Honey bee gut microbiota promotes host weight gain via bacterial metabolism and hormonal signaling, May 2, 2017, vol 114, no. 18) on this very topic. We can see how bees with a strong gut microbiota gain weight, how it affects insulin levels which signal hunger, how the gut microbiota helps with fat storage and short-chain fatty acid production. If we can show how the gut microbiota helps bees gain weight and be more robust, this can help inform beekeepers and help protect the honey bees’ primary food sources. Microbiome – the community of microorganisms including bacteria, viruses and fungi, that live in, on and around a host. Symbiosis – a healthy and harmonious balance of the microbiome. Dysbiosis – a disruption of the microbiome’s symbiosis. Antimicrobial Resistance – evolution of microorganisms through genetic changes to render perceived threats less powerful (e.g., antibiotics designed to kill a bacteria). Serratia – an opportunistic bacterial pathogen that is part of the Enterobacteriaceae family. CATCH THE BUZZ: USDA-Focus On Honey Bee Health. Pettis.